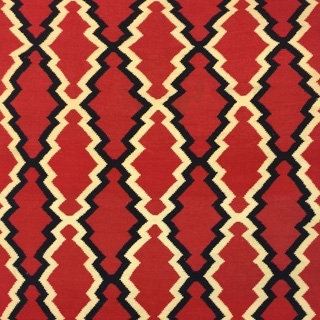 Navajo chiefs blankets are the most recognizable and valuable of all Navajo weavings. They have been collected not only by other Native Americans before the United States even existed, but also by such notable collectors as William Randolph Hearst. Scholars and collectors usually classify Navajo weaving into four overlapping periods defined by types of products, styles, and materials, although few scholars agree on the appropriate dates for each period. In any event the dates and periods should be understood only as a rough chronology allowing for many exceptions: Classic Period, 1650-1868, Late Classic Period, 1865-1880, Transitional Period, 1868-1895, Rug Period, 1895-Present. Hopi Manta with Indigo Dyes c. 1880, 39" x 57"
Hopi Manta, c. 1900, 33" x 42"
Navajo Child's Blanket, c. 1870, 54.5" x 37.5"
Navajo Child's Blanket, c.1890, 44" x 34"
Navajo Germantown Eyedazzler Blanket, c. 1890, 79.5" x 57"
Navajo Germantown Eyedazzler Blanket, circa 1890, 71" x 57"
Navajo Germantown Sampler c. 1890, 26" x 21.5"
Navajo Moki Revival Blanket c. 1980, 36" x 39"
Navajo Moki Revival Blanket with Crosses, c. 1990, 70" x 43"
Navajo Moki Revival Blanket, c. 2000, 142" x 70"
Navajo Revival Blanket with Crosses c. 1980s, 61" x 45"
Navajo Revival Wearing Blanket, c. 1980, 74" x 47.75"
Navajo Third Phase Chief Blanket Revival, c. 1930s, 50" x 63.5"
Navajo Third Phase Chiefs Blanket, c. 1920, 74" x 67"
Navajo Transitional Blanket c. 1890s, 62" x 51"
Pueblo Manta, c. 1880, 38" x 48"
Zuni Manta, c. 1890, 36.5" x 49"